It's been a busy week, filled with proofreading crossword puzzles (my very part-time freelance job), writing the preface for my book, catching up with mom friends, and visiting the OB for a routine check-up for baby #3. When I wasn't doing those things, I was trying to read! Here's this week's report. The flowery writing style slowed me down quite a bit, so this short book ended up taking me several days to finish. I like the author's main arguments and will have more to say in an upcoming review. I still have a couple of these to read and then I'll do a post about the series. Probably the middle of next week. These are two editions of the same book, which I will be reviewing and comparing in a post at the end of this week, hopefully. I read these aloud to Miss Muffet (age 3 years 8 months). I've already reviewed one book from this series, and I don't think I have anything new to say, so though these are nonfiction, I probably will not end up reviewing them for Old School Kidlit. I also want to mention Confessions of a Domestic Failure by Bunmi Laditan, which was on my currently reading list last week. My digital library copy expired and there were a lot of holds, so I didn't get a chance to finish it, but I did make some comments (mostly positive) on Goodreads. I haven't touched this in a few days, but the descriptions are so lovely that I know I will eventually finish it. Since it's a re-read, it's just not a priority. I keep this book on my nightstand, telling myself I'll read it each night before bed, but I forget how tired I am in the third trimester and so I haven't touched it all week. I'll probably have to choose a day to make it a priority and just zip through it. I'm reading the ebook of this on my phone and I'm really enjoying it. I expect it to be one of the first books I finish this week. I started this early last week and have not been great about keeping up with it so far. I still plan to finish it before the end of the month. This collection of essays and articles by Newbery author Katherine Paterson is my favorite of my current reads. There's a good chance I will have finished it by the time this post is live! I'm linking up today with It's Monday! What Are You Reading? 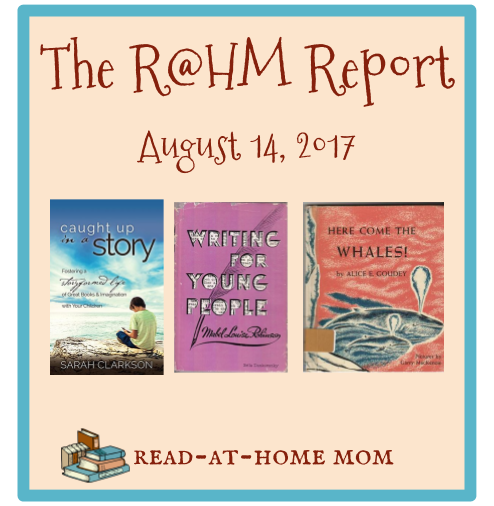 hosted by Unleashing Readers/Teach Mentor Texts and Book Date. I love the Jane Fritz series. Great for fifth grade. What a fun corner of proofreading! How did you start proofing puzzles? Katherine Paterson seems like the perfect person to give advice on writing for kids. I hope you enjoyed the rest of that book! My sister actually does it and when I became a stay-at-home mom she suggested that I try it. It can be tedious, but mostly I enjoy it. I agree. I enjoy her Facebook page also. Sadly, I didn't get to finish the book, but I'm hoping it will happen today. Nice assortment of books. Come see my week here. Happy reading! What an interesting sounding freelance job. Come see what I'm reading.